St Patrick's Day, a cause for celebration even if my Irish heritage is only in my name. As a non drinker there will never be any Guiness, green or otherwise unless it is in my cooking. However, I am happy to embrace other aspects of the celebrations. 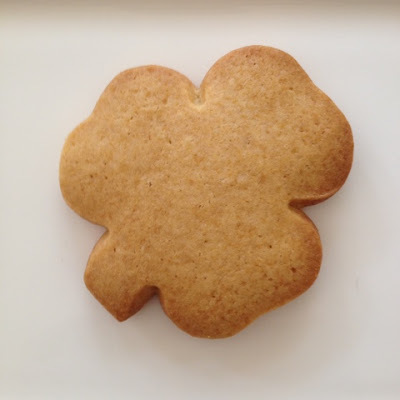 My favourite little leprechaun, relatively small. about eighteen centimetres in length and beautifully sculpted. Most of the time he hangs out in my sewing room but on St Patrick's Day he is moved to the family room. 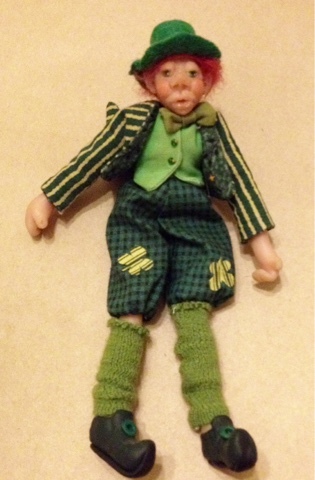 He was made for me many years ago by an incredibly talented friend and doll maker, Rebecca. His head, hands and legs from the knees down are sculpted from polymer clay, the rest of the body is firmly stuffed cloth. The costume is made from a selection of green fabrics and of course, his hair is red. 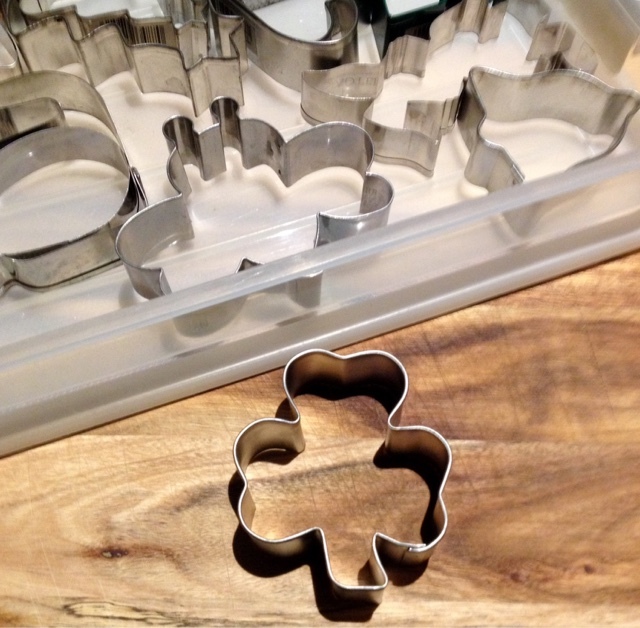 I hunted out my shamrock cutter and baked a batch of cookies using this dough. The plan was ice them in that particularly vivid green, however, some guests arrived, the biscuits were eaten and then the urge passed, it hardly seemed worth icing the remaining biscuits. Then it was off to the movies to see Brooklyn A film about a young Irish woman who immigrates to Brooklyn, an area of New York with a large population of Irish immigrants. 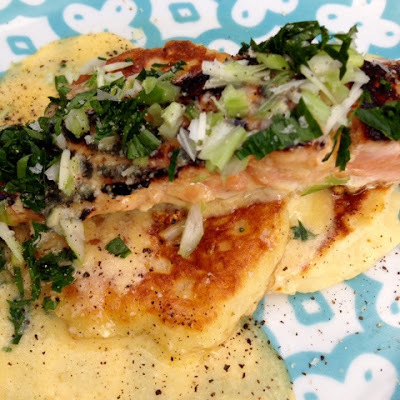 Dinner was Boxty, a traditional Irish pancake made with mashed potato and grated potato served with pan fried marinated salmon and lemony butter sauce and garnished with a generous sprinkle of finely chopped spring onions and parsley. The salmon was marinated in whiskey and honey. The marinade adds an interesting flavour to the salmon and the honey and helps with the browning of the skin and the top of the fish - Maillard's Reaction is the proper scientific name for the process. The sauce is a simple lemon butter made by slightly melting some butter, whisking in an egg yolk and a tablespoon of lemon juice. Garnish with some finely chopped parsley and spring onion. 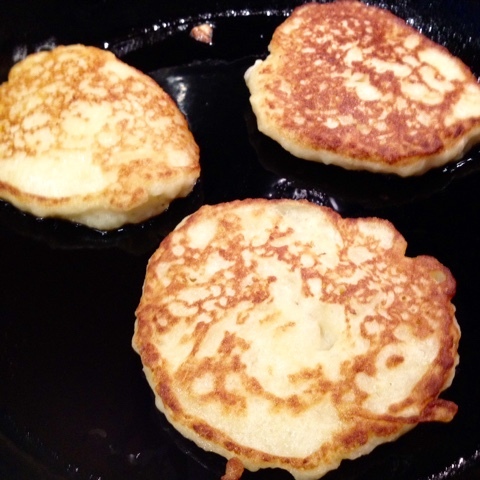 Place all ingredients in the saucepan that the potatoes were mashed in (or a bowl) and mix well to make a thick batter. You may need to add a little milk if it is too dry or some extra flour if too wet. Mix whiskey and honey together in a non reactive bowl. Add salmon fillets, cover and refrigerate for several hours or overnight. Heat a small amount of oil in a non stick pan. Add salmon flesh side down, cook for two minutes, carefully turn the fish over and cook a further three minutes or longer if necessary. Turn off heat and allow fish to stand for a few minutes. It will continue to cook.